Loftus to Celebrate the Queen’s 90th Birthday in Style on Saturday! 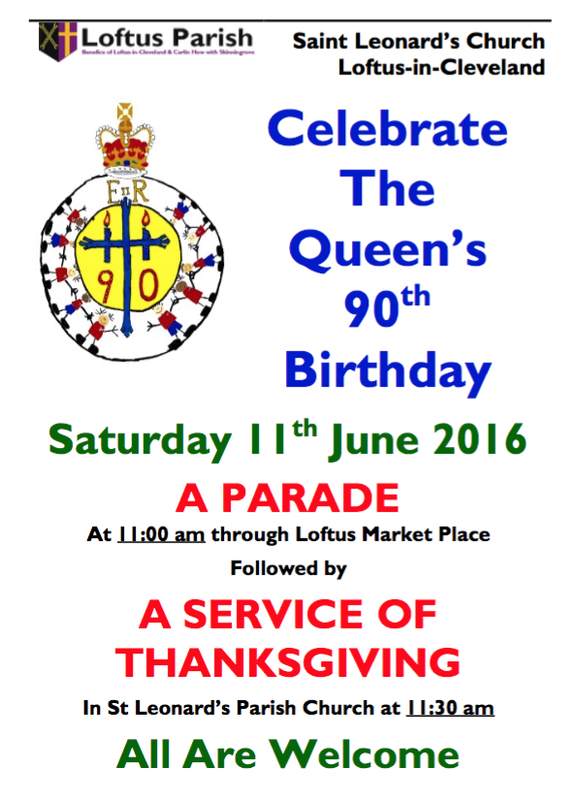 On the morning of Saturday 11th June 2016 the town of Loftus will host a Parade and a Service of Thanksgiving to celebrate HM The Queen’s 90th Birthday and all are welcome to attend! Civic and community leaders will join the Mayor of Loftus and the Mayor of the Borough of Redcar & Cleveland, in Loftus Town Centre to witness cadets and members of uniformed organisations, from across Teesside, parade through Loftus at eleven o’clock in the morning. Following the parade, a muster and a formal inspection will take place outside of Loftus Town Hall, which will then be followed by a special Service of Thanksgiving in Saint Leonard’s Parish Church Loftus, where the Bishop of Whitby will deliver the sermon. The Deputy Lieutenant of North Yorkshire Mr David Kerfoot MBE DL will be attending the events in Loftus to formally represent HM The Queen. Copyright © 2019 Loftus Parish. All Rights Reserved.